All across the state of Illinois, planners and builders are seeking out the best construction contractors to ensure a quality outcome that meets their exacting design specifications. Every service needs to be implemented in an accurate and timely manner to keep your timetable on track. Signing on with a qualified commercial drywall company, for example, can help to achieve a timely outcome that is also affordable. When it comes to facilities such as multi-family homes, managing the entire scope of construction can become a serious challenge. For almost 20 years, our drywall contractors in Chicago have worked hard to deliver amazing results for projects of all sizes. We specialize in commercial and industrial drywall installations, and can work with you to create a personalized plan that accounts for your facility needs and your budget. 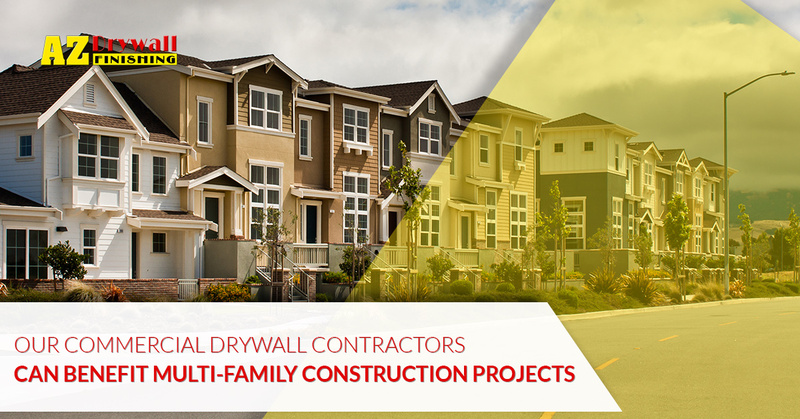 It pays to work with a drywall company that can provide reliable results day-in and day-out. Today, we’ll highlight a few challenges of multi-family projects that our team can work to overcome. Call us today to learn more and to receive a speedy quote for your project! Multi-family projects such as condominiums are often complex, relying on electricians, plumbers, soil inspectors, contracted engineers, and more professionals to complete a major undertaking in a relatively short period of time. In many cases, builders will be fined for not meeting completion deadlines. Our drywall finishers will arrive on time and ready to work, ensuring you have the skilled hands necessary to get the job done. Many drywall companies in Chicago get in the habit of overbooking their services, leaving few laborers available to get your job done efficiently. AZ Drywall Finishing has the experience and equipment needed to keep in accordance with tight scheduling windows. It can be all-too-easy for something to go wrong; the wrong diameter of pipe comes in, or the city inspector has to delay until next week for a passing grade. Our drywall installation team specializes in metal stud frame and wall finishing as well as part of our turnkey services. We’ll work with you every step of the way, and that process begins with open communication. As you go through each phase of your multi-family project, you’ll likely encounter a plethora of unforeseen circumstances that necessitate calls, meetings, and changes. It is vital to hire a commercial drywall company with a reputation for clear communication. Our skilled team will arrive on-time and ready to counsel on any updates or needs. You can rely on AZ Drywall Finishing to be reliable every step of the way, providing clear lines of communication to keep everyone on track for success. We want to get the job right the first time, too! Since 1999, our industrial drywall company has worked hard to perfect our services. Installing drywall can be a laborious task, especially when your teams are deployed in numerous buildings across large, chaotic sites. Our drywall installation crew will provide the full-service support to ensure precise results. Nobody likes to waste their time and resources fixing a simple mistake, which is where the AZ team is trained to excel. We take pride in the accuracy of our drywall results, whether it’s for framing inspections or performing final walkthroughs. Industrial walls must often conform to precise specifications. Our drywall contractors can deliver businesses across many industries, as well. From medical applications to restaurants, AZ Drywall Finishing is ready to deliver. Be sure to contact us to learn more about our full line of wallboard services! Creating an aesthetically pleasing space across multiple units can prove to be time-consuming, especially if your drywall crew does not have the training to meet your building codes. Multi-family projects vary in size and scope, with elements such as the texture making major impacts on the cost. Builders often rely on knockdown or orange peel textures as the standard for quality in modern housing, with custom textures available for more exacting requirements. AZ Drywall Finishing strives to maintain the highest level of quality for all of our drywall projects across Chicagoland. If you are on this post because you are in need of an experienced drywall company, be sure to contact us today for a free quote. We look forward to hearing from you!